Several years ago we created a hardcover marketing piece for a client we were courting. It was back in the day before PDFs were the preferred form of document delivery. My favorite part of the hand-made (yes, hand-made. I actually broke a beer bottle and cut up my hand assembling these) book was the inside front and back covers that listed out a bunch of “Does Your Business…” questions. Does your business have a good reason? No? Why not? It doesn’t matter if it’s an employee or a vendor, everyone should have a solid reason for the things they do. Otherwise, quite frankly, what they’re doing is just a hobby. Why should be asked all the time. And clear and quick answers should always be given. I’ve seen it happen a lot specifically amongst creatives. It seems that their minds tend to race faster than they can control the purpose of what they’re doing. It’s actually a great part of the creative process. You just need to make sure you take it to the next level before stopping. Internally we’re asking why all the time. Until we have an acceptable answer, we’re not done. To me this is a true to test to see if someone is competent in what they do. Sure, you can wow me with great design, but telling me why it was done that way is what’s truly impressive. Launch a new website that has all the bells and whistles, but be clear on why I should use your product. Tell me I need a new message, but explain to me why the old one isn’t working. You tell me over and over that you’re the best, but I need to see why I should believe that. Kids are outstanding at this. At around age two or three when they start forming a vocabulary they get into that annoying and repetitive why reply zone. Go wash your hands. Why? It’s time for bed. Why? Look both ways before you cross the street. Why? It drives a parent crazy, but why shouldn’t they ask why? We’ve all been guilty of saying “because I told you so” and in some situations that’s fine. But shouldn’t children understand the deeper reasoning of why they shouldn’t take candy from strangers? Too often businesses make changes and make decisions based on whims. It’s time for a new advertising strategy because I’m tired of the old one. I want to restructure the sales department because I want to show I know what I’m doing. These aren’t reasons, their whims. How many impulsive decisions can you think of that you’re company has made? Every time we present concepts to a client there’s a strong reason and meaning behind the strategy and the creative. There has to be because we fully expect to be challenged. (Full disclosure, our reasons aren’t always accepted, nor are they always correct…that’s part of the creative process) It’s not about a client not respecting our decisions, it’s about them wanting to understand the process. It may be a wild idea created to push them out of their comfort zone or it may be as we’ve seen in the shocked look on a client’s face, our recommendation that they don’t change what they’re doing. They wonder, isn’t that counterintuitive to you getting more business? Sure, we could try and up-sell services, but I’ve never seen that effectively work on an intelligent consumer — it’s safe to say that I consider all my clients intelligent consumers. I absolutely love when a client asks why. It’s the opportunity to take them into the process and further explain a concept. Of course, there are wrong ways to ask why and we’ve seen clients do this as well. Don’t ask why before you’ve taken the time to understand the scope and environment in which the other person is working. Don’t ask why before you’ve tried to get into the other person’s mindset. Don’t ask why and then not listen, consider or respect the answer. and always have an outstanding answer to the question: Why? So, what are you doing now? Why? Does your business…stand out like this? Author: admin In: Does Your Business Comments: Comments Off on Does your business…stand out like this? Next time you hand out your business card think about how you could improve that first impression. 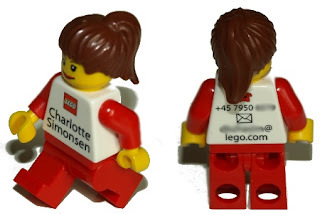 That is a photo of a Lego employee’s business card. Outstanding! I Saw this at Alexander Kjerulf’s blog. Author: admin In: Does Your Business, SP News Comments: Comments Off on Does your business…Thank you! I’d like to apologize for using Thanksgiving as an opportunity to say Thank You. But I’m going to do it nonetheless. THANKS!…to everyone at SOZO | Pivotal who makes this a great company and does their best to provide the best for our clients. THANKS!…to all of our clients who put their trust in us. THANKS!…to all the people who read this blog and provide their comments. THANKS!…to all the other people who write blogs and share valuable information with the rest of the world—free of charge and simply because they are passionate about what they do. NBC has announced that it is eliminating its Fall new show debuts in favor of a more balanced year-round offering of new content. This is a major shift for television and one that will most likely be a lift for NBC if the other three major networks don’t jump on the bandwagon. It’s been a tradition for television viewers to look forward to the “summer’s over, school’s in, new TV shows start” passage into Fall. Now NBC is abandoning that industry tradition in an effort to differentiate its brand, better accommodate advertisers and grab more viewers. There are two types of tradition—the kind that is borne of a company and the type that is a long-term tradition for an industry. Are the traditions you follow part of your industry or are they part of your company? Your company’s tradition is part of its history and story. It’s part of the fabric of your brand. But, on the other hand, your industry’s tradition is something that was likely created way back when by the industry leader at that time. Which tradition does your business follow and cherish? …have a brand that is based on fear, love or hope? Check out Seth Godin’s blog post to help you answer that question. …have a CEO who wears the company’s brand on his/her sleeve? I was just reading about a couple of CEOs who do exactly that. Howard Schultz and Steve Jobs. They aren’t hired gun CEOs. They’re very passionate about their respective companies and it shows. Starbucks’ stock was down almost 50% in 2007. When Schultz announced a couple of weeks ago that he was returning as CEO, people got excited and the stock started to percolate. As for Jobs, people are obsessed with what he’s going to unveil today at his annual keynote address at MacWorld. A CEO must be a leader and visionary. A CEO must also have a personality and place a human touch with everything he does. I really think these two guys personify that. Does your business… pay attention to what’s on the inside? Author: admin In: Does Your Business Comments: Comments Off on Does your business… pay attention to what’s on the inside? There are a number of things that influence the brand of a company. From the image that they create, to the quality of their product, all actions play a unique role in their overall perceived brand. However, many companies overlook one of the biggest opportunities they have to control their image, the setup of their business office. Not only can a specialized design of an office space increase work productivity and bring a positive attitude to employees, but it serves as a chance to send a visual message to everyone who enters. The look of the office sets the mood of what’s “inside” the company, which greatly affects the overall “gut feeling” that people have when they walk through your doors. Additionally, the design of the office can aid in the important challenge of attracting employees and putting them in the best position to do their best work. Everything a company does reflects on its brand in some way.